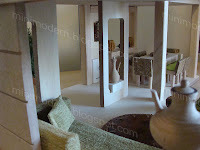 Let's see...I think the only rooms I haven't done for these conjoined Green Dollhouses are the kitchen and bathroom. True, I planned the rooms poorly---one bathroom for a family of 5??? Chuckles. After I finish this family house, I'm gonna set these dollhouses up as some sort of green development townhouses. 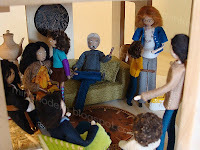 Well, this is what I say today...I've also been eyeing my Villa Sibi lately, pushing Mike & Sheila peg dolls around and contemplating a new dollhouse so...who knows? Shrug. The scene with figures shows both sets of grandparents coming over to visit. The goods: Dining table is Selecta; Dining chairs are Plan Toys; Shelving in living room is Plan Toys; Sofa is PRD; living room chair is Reac; Rug is a coaster; Pottery is Jonathan Adler and random ebay purchases; Pine cones, acorn stool and giant pot are from some potpourri mix I was given years ago. All accessories are Re-Ment, old jewelry pieces, and action-figure extras. The dolls are Silver Acorn. 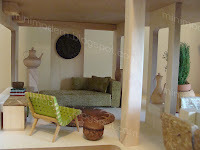 What beautiful rooms - the soft colours, the textures, the shapes - I'd love to come and visit too! Great fabric on the sofa - did you choose it, or buy a ready-made one? Thanks much! The sofa was made by Paris Renfroe. I won it on ebay. Mr. Renfroe used the same great fabric on the sofa featured under the "Sectional Relationships" post. even the chairs with thick legs (I hate them in my dollshouse) looks very good. 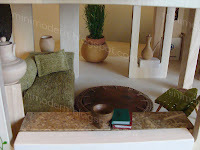 I like the fabric of the sofa too, and the touch of a little green that everything has. Yeah, those tree trunk legs. Remind me of my own unsexy pair. Perhaps that's why I took pity on them--Ha Ha! I'm trying to use all the original Plan Toys pieces in each scene but will probably use other items when I start the kitchen and bathroom designs. But, then again, who knows. I might work something out. Smiles. those are so cute. beautiful! These are so cute. Very nice! I agree...calm & relaxing. The PRD sofa looks really good in this space. I would look forward to seeing more of his pieces in these houses. Ha ha--No, I'm not abandoning the Villa Sibi. Thank you! The rooms are small so it's hard to get pieces into the space. Most of my PRD pieces are larger for larger houses. I've still got some items that I haven't used by him though. Let's see what happens when I try to work out the townhouse decorating. Hmm...This is a bit of a tricky question to answer. What price range are you considering? What kind of modern design? How many rooms are you looking for? Let me know. Also, there is a list of modern dollhouses on the right frame. Many of them are still for retail. For around $155 (assuming you are looking for a collector's type house and not a children's dollhouse), you could probably get the Celerity Summer House Kit or the RGT Contemporary Dollhouse Kit or a M112 POD by Paris Renfroe. If you up your budget by $50 (and figure in some additional cost for shipping), you could get the main unit of Mini House 1 by Wes. Perhaps if you were not thinking 1:12, you could get something custom at 1:16 scale by some of the artists mentioned here or someone local that you know. 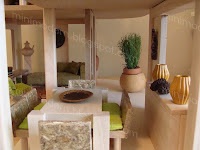 Also, you could always build your own showpiece--however, once you get started, the $155 spends quickly. Oh man! I wish there was a Frankie Wright-style dollhouse available. I've only seen one--and it was a shell created by Lawbre without the "budget friendly price". Anybody else have $155 suggestions for our anonymous friend?